Like the doors opening at a summer sale, Ontario’s electricity stakeholders are faced with a large selection of energy planning topics that the Government and its agencies would like your views on. Just like those mid-season sales the window of opportunity is short so you need to choose the areas to focus your energies on wisely. To show you how the initiatives fit together and help you navigate among them, I’ve provided an overview that charts the consultation initiative sponsor, key topics, and period for input and comment. This frenzy of activity is clearly a demonstration of the Government’s action towards increased transparency with stakeholders. 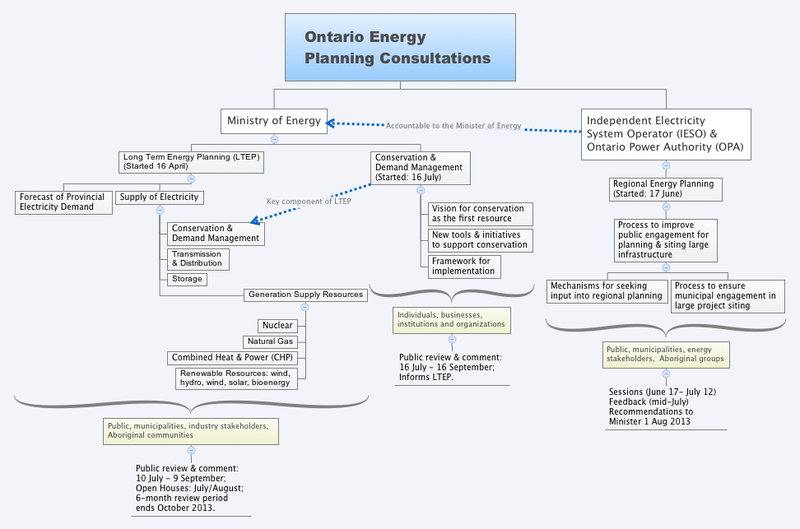 However, given the importance of getting informed feedback to drive important policy and process decisions affecting Ontario’s energy future, you think there would be more time devoted to thoroughly consider major issues and obtain input. You’ll see that the announcement of activities and availability of materials happens just when folks are off enjoying summer vacations. Furthermore, the deadlines for providing comment on some of these initiatives are roughly 60 days, closing right after the dust settles on back-to-school activities. Just like those fleeting summer sales, will stakeholders or the public be satisfied with a quick interaction believing that something useful has been exchanged, or will the lasting perception be simply that of a well intentioned exercise delivering marginal value on both sides? Collaborative consultation takes more than the occasional foray beyond public policy walls to understand what people think. It requires the building of trusted relationships developed through a thoughtful program of interaction, mutual learning and discussion. 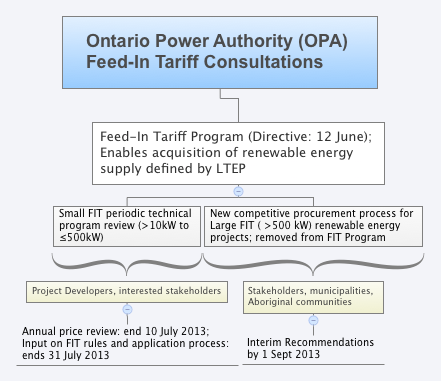 Click here to see a chart of Feed-In Tariff (FIT) Program consultation activity. FIT supports the addition of renewable resources defined in the Long Term Energy Plan (LTEP).